Danish cabinetmaker Soren Horn was active in the middle of the 20th century. 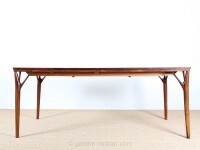 In the early 1960s Grete Jalk designed desk for this furniture producer. Søren Horn also obtained the rights to Vestergaard Jensen's production in the late 1960s.The original furniture carries the burn mark of Soren Horn. 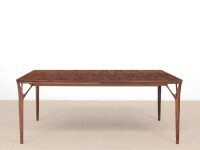 Scandinavian dining table in Rio rosewood 8/12 seats.